alaTest on kerännyt ja analysoinut 85 arvostelut tuotteelle Nikon D850. Keskimääräinen antama arvosana tälle tuotteelle on 4.7/5, verrattuna keskimääräiseen arvosanaan 4.3/5 kategoriassa Digitaaliset kompaktikamerat. Me analysoimme käyttäjien ja ammattilaisten antamia arvosteluita, tuotteen ikää ja muita seikkoja. Verraten muihin tuotteisiin kategoriassa Digitaaliset kompaktikamerat, Nikon D850 on saanut alaScore™-arvosanan 97/100 = Paras. Is this the most versatile professional DSLR ever made? . Nikon D850. The Nikon D850 is the perfect blend of high-resolution, speed and performance. It’s an all-round sensation and will be hugely popular with its target audience. The Nikon D850 is the first DSLR that truly fits both speed and resolution in the same camera. The Nikon D850 offers the best of all worlds: extreme resolution, fantastic image quality, fast shooting, and an exceptional build. It's our favorite pro SLR. Full-frame 45.7MP image sensor. 153-point autofocus system. 7fps burst shooting. Wide ISO range. 4K video. Large optical viewfinder. Tilting touch LCD. Dual card slots. Bluetooth and Wi-Fi. Live View focus uses contrast detection only. Omits built-in flash. SnapBridge system needs some work. 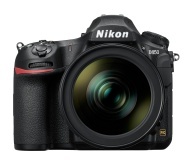 The successor to the Nikon D810 hits 45 megapixels and 7-9 fps continuous shooting. Nikon D850 review: The best DSLR ever? Right now, it's hard to think of a better camera than the Nikon D850. It's a photographers' camera. And a clear contender for camera of the year. The Nikon D850 impresses on paper. But after sustained use it's blown us away. This is one mean 45.4-million-pixel picture-making machine.